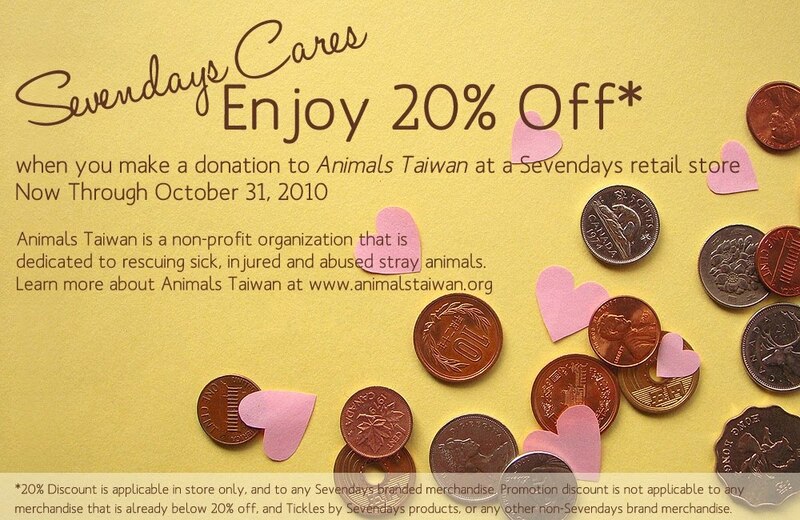 During the dates of October 15 – October 31, 2010 for a donation to Animals Taiwan you can enjoy 20% Off discount on any full-priced Sevendays branded merchandise at any of our retail store locations (Tun Hwa South Road or Eslite Hsin Yi). This promotion is not applicable to any merchandise that is below 20% off and Tickles by Sevendays merchandise. - Sevendays will place a collection box at the register counters, visible to all customers, with promotional signage of the event details. Sevenday will accept any amount of donation, as long as you donate you will receive the 20% off discount. Sevendays was founded in 2007 in New York City, our vision is to create clothing and accessories that can be worn for every occasion. In 2008 we opened our first retail operations in Taiwan. We dedicate a special portion of our business in creating Organic products such as T-Shirts and Plush Toys – maintaining our dedication to doing what we can to help the environment. 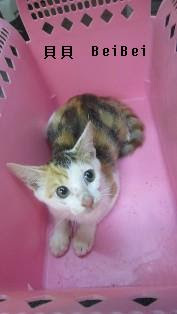 This season, we wish to partner with Animals Taiwan to further promote our cause of animals that are in need of help. Great News! Kittens found new home! These 2 lovely kittens have found a new home! Let us give them our warmest wishes!